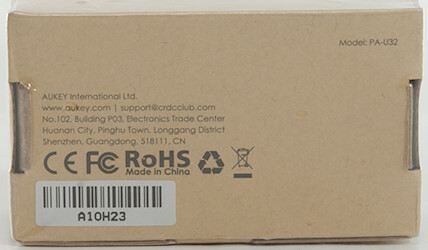 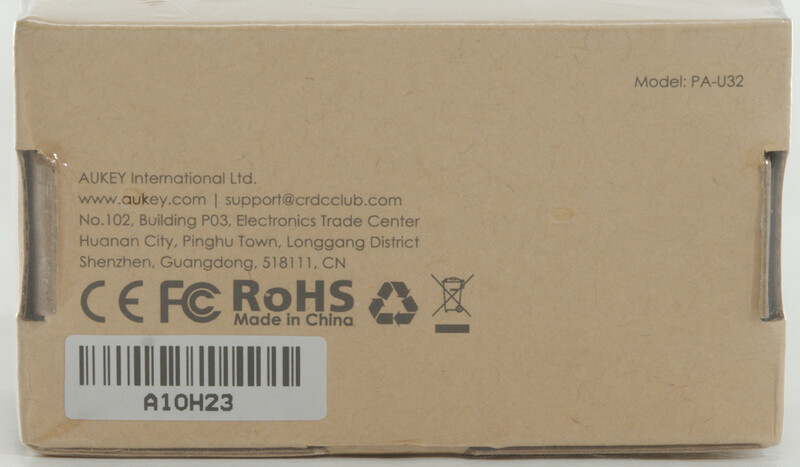 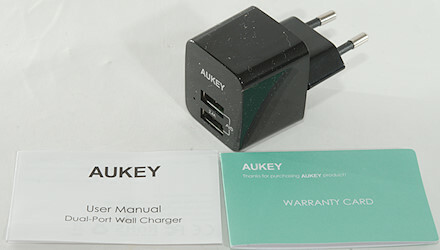 The box included the charger, a instruction sheet and a warranty card. 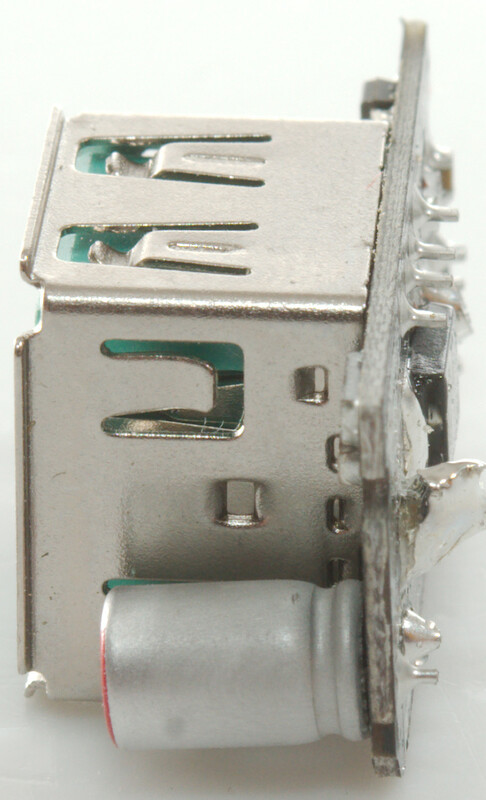 There is a small hole in the front with a weak white led behind it. 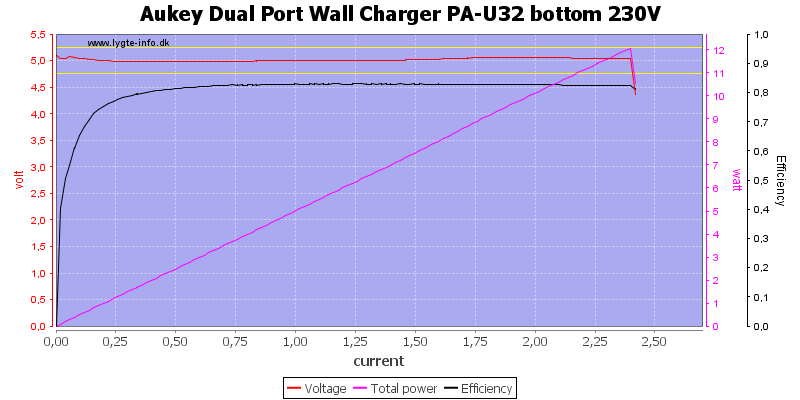 Both outputs are in parallel. 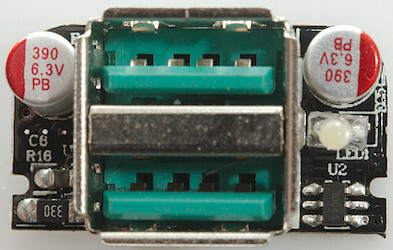 It is the same for the bottom output. 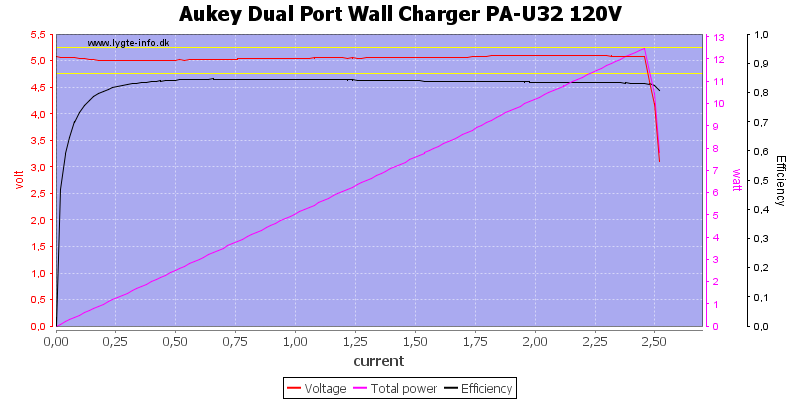 And also when used in parallel at 120VAC, the limit is slightly higher at 120VAC. 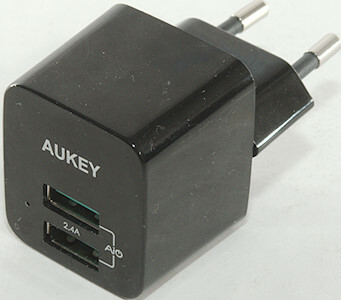 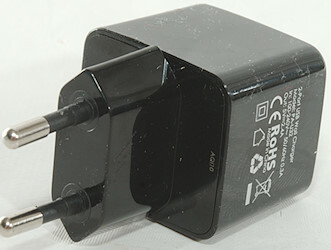 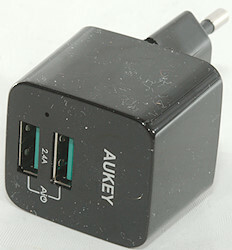 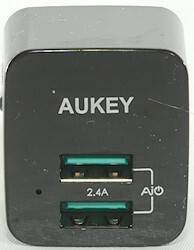 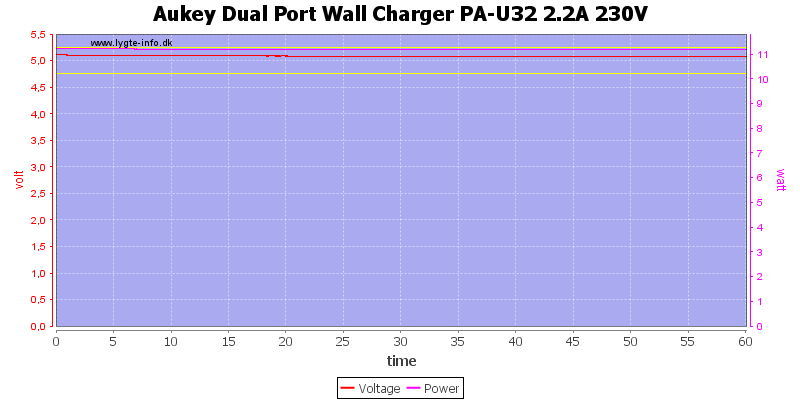 The limit is too close to 2.4A, the charger cannot deliver 2.4A for more than 10 minutes, before output drops. 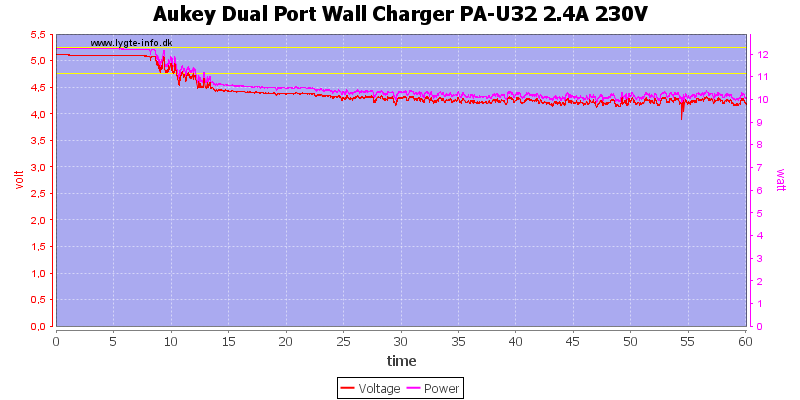 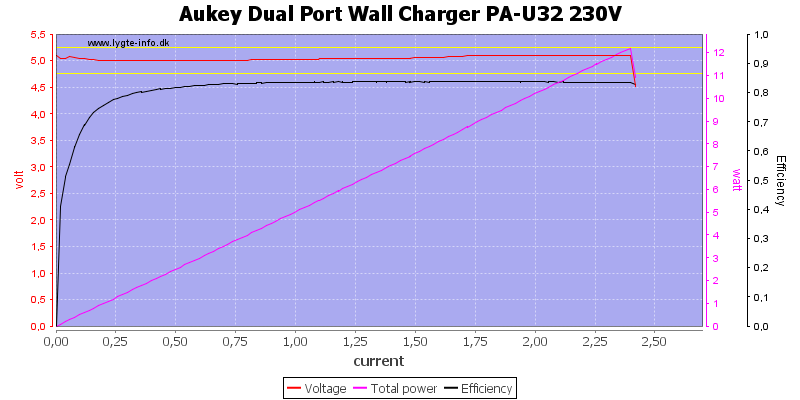 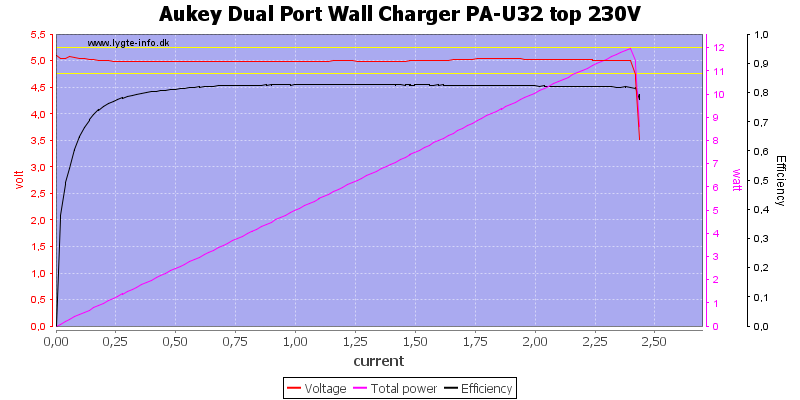 Reducing the output to 2.2A helps, now the charger can deliver current for one hour. 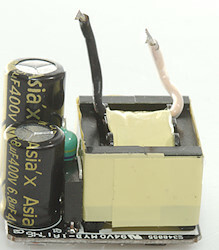 Noise at 0.5A load is: 17mV rms and 803mVpp. 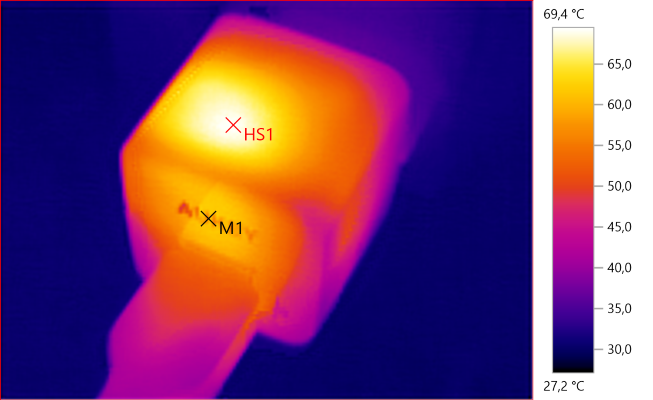 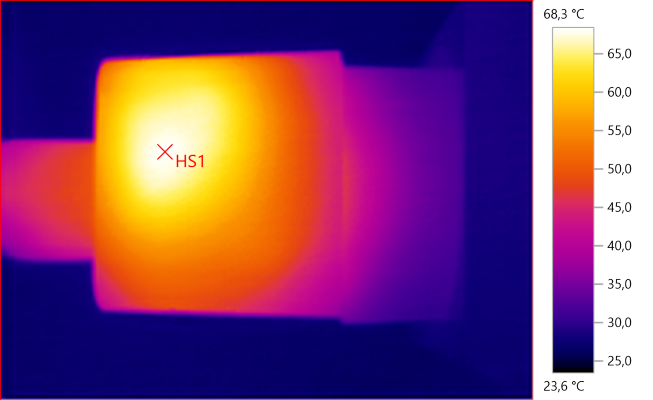 Noise at 1A load is: 21mV rms and 715mVpp. Noise at 2.5A load is: 67mV rms and 949mVpp. 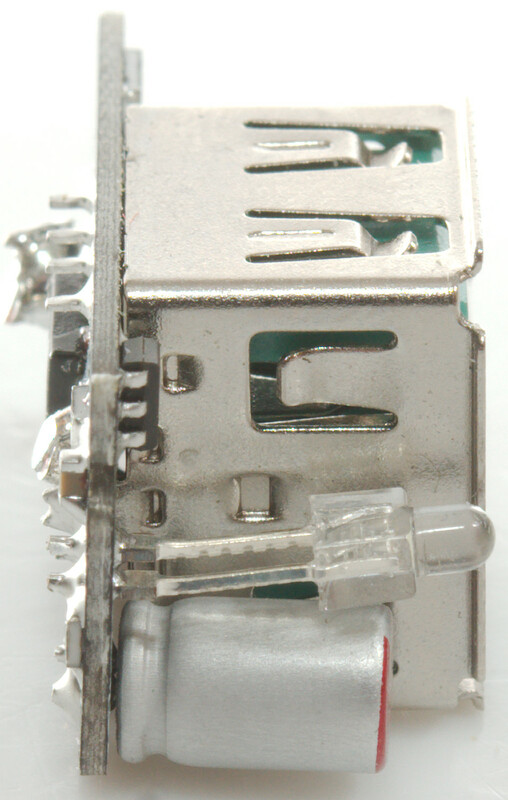 My vice could break the glue and the I could pull it apart. 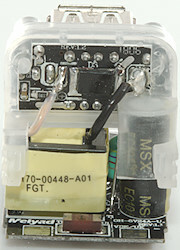 The electronic is in a clear plastic holder. A few more views of the plastic holder. 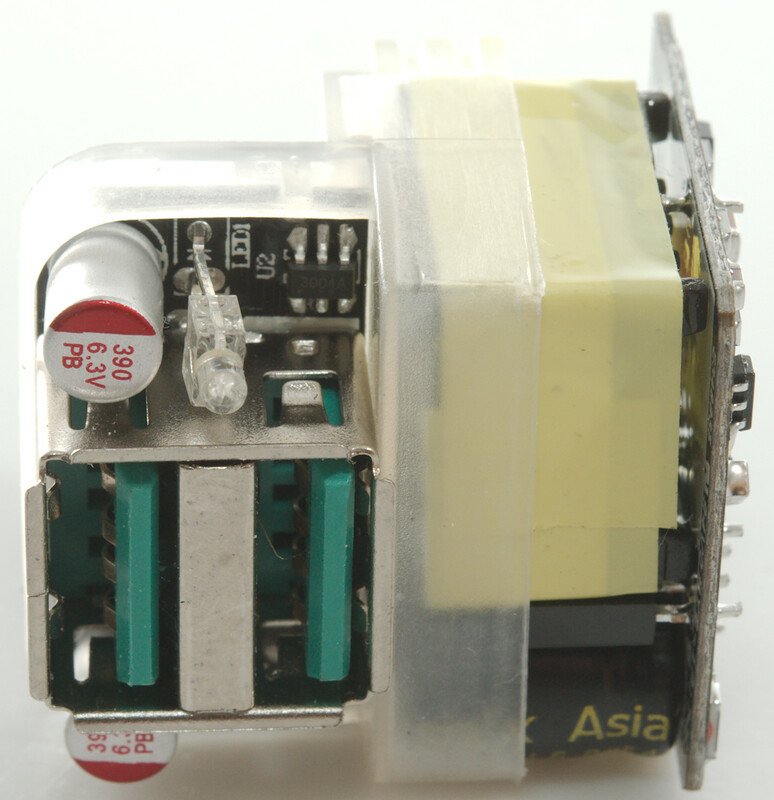 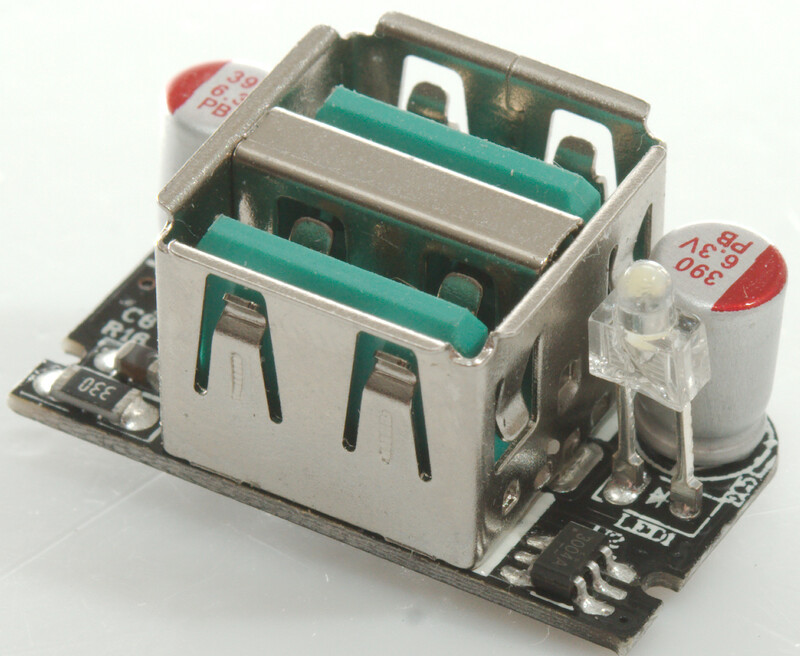 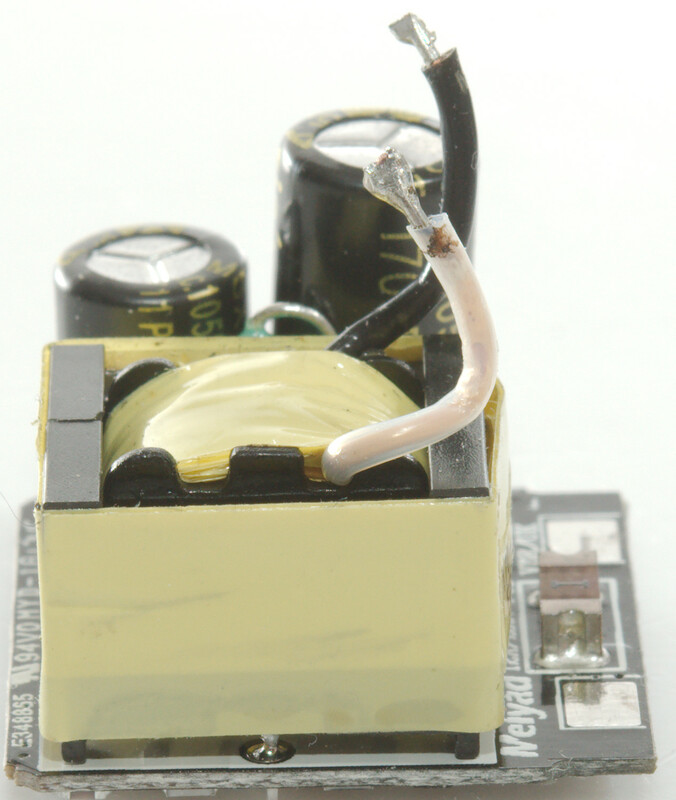 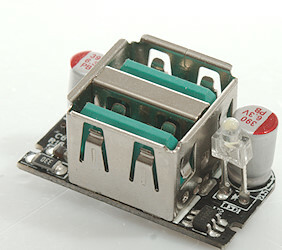 The electronic is on two circuit boards, one for mains and one for low voltage, due to the plastic holder there is very good isolation between them. 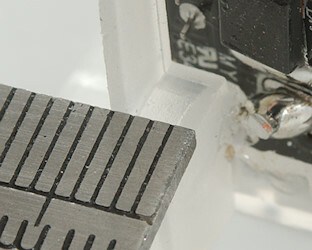 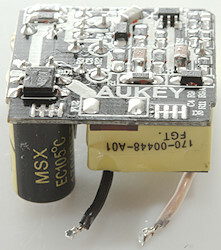 The two circuit board and the holder. 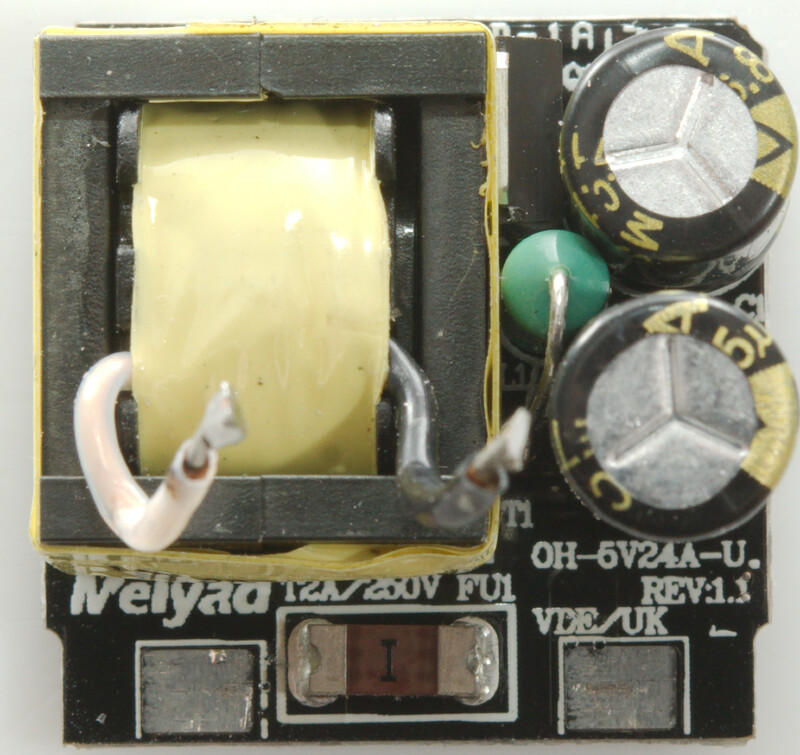 On this side is the rectifying diode. 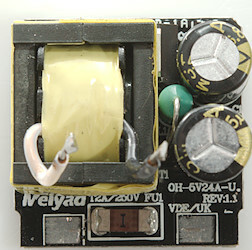 This is the mains circuit board with the fuse (FU1) and a inductor (L1) between the two smooting capacitors. 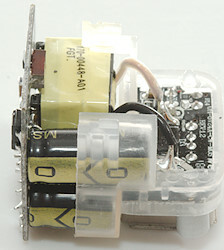 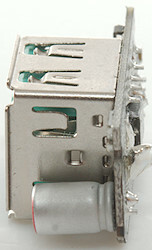 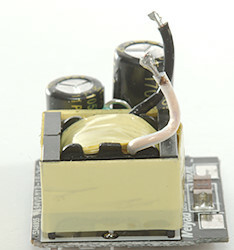 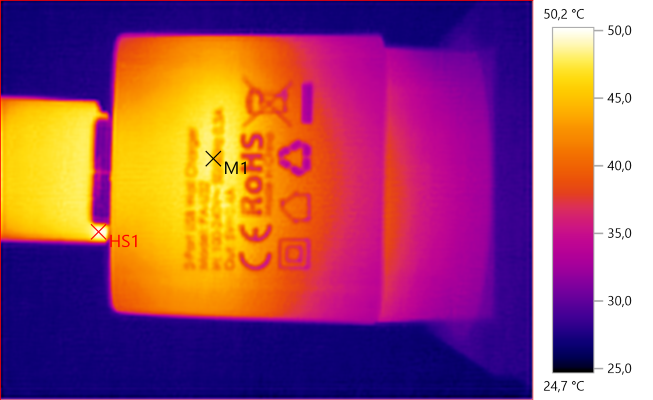 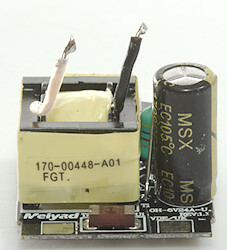 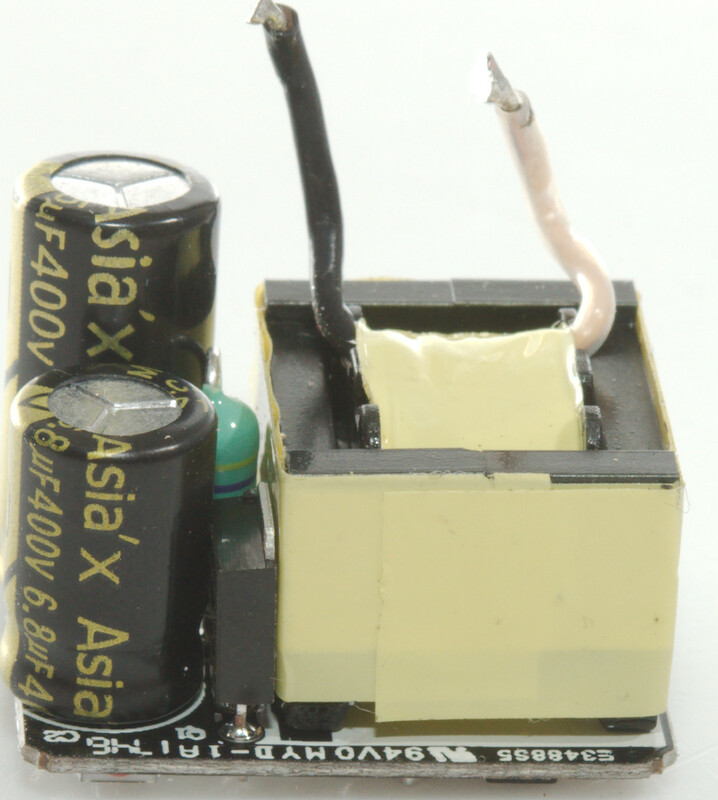 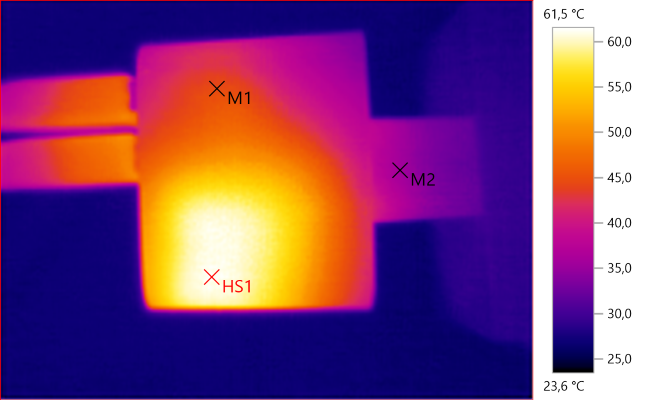 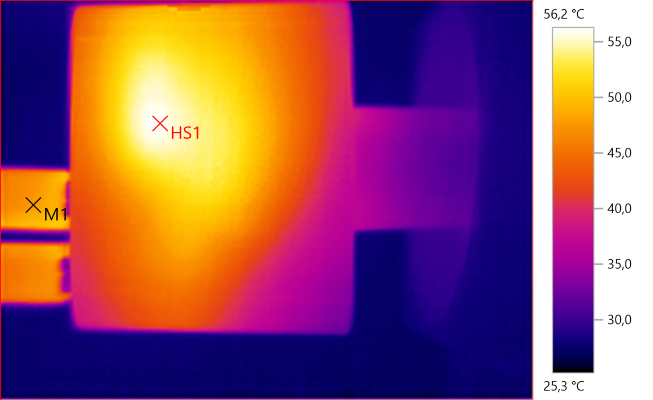 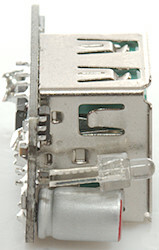 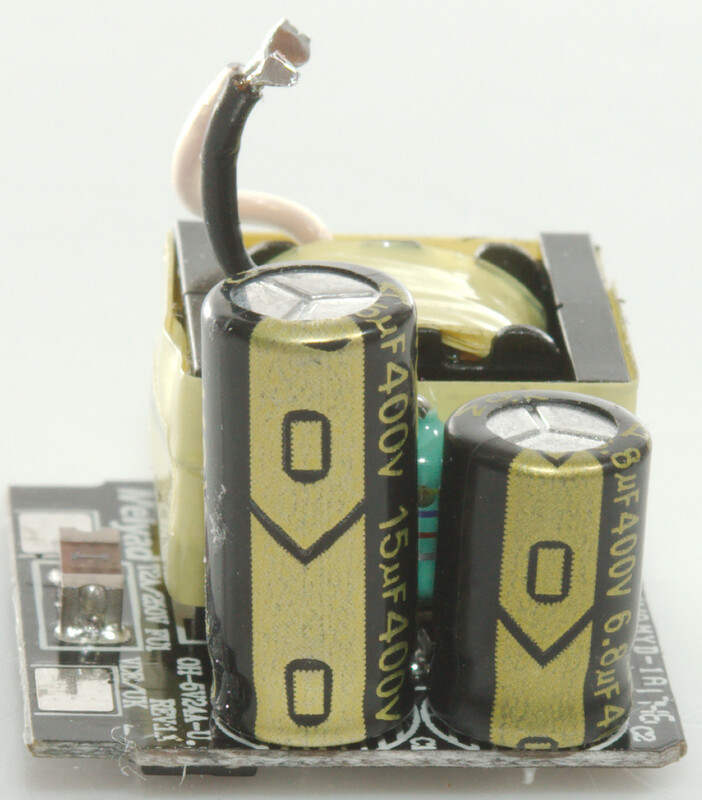 There is also a switcher transistor (Q1) between one of the capacitors and the transformer. 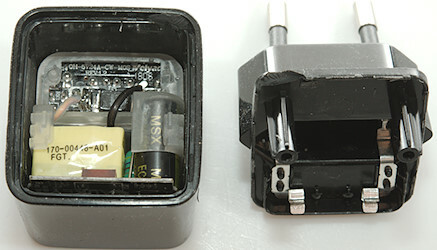 This side has a bridge rectifier (BD1) and a switcher controller (U1). 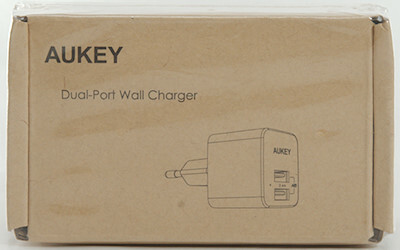 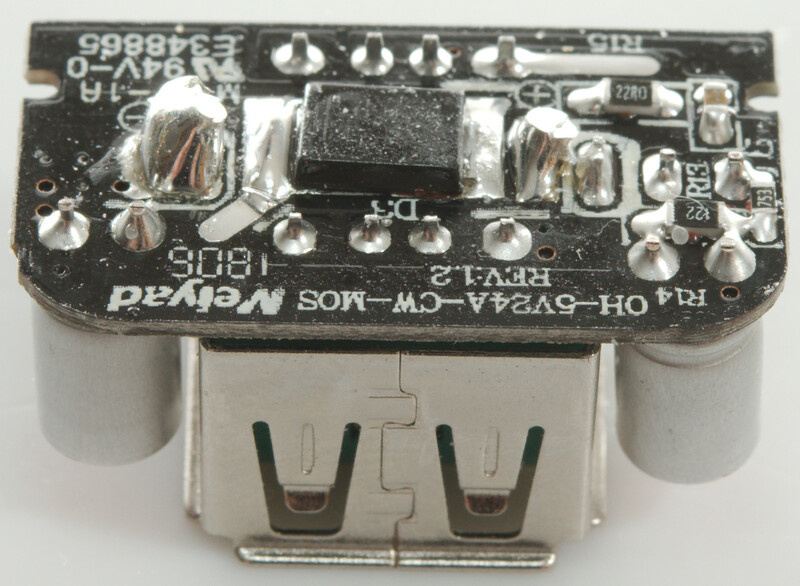 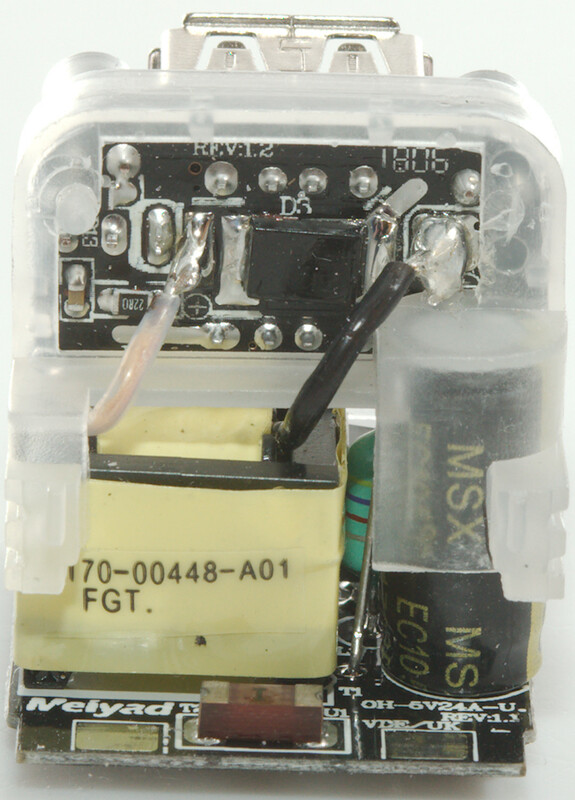 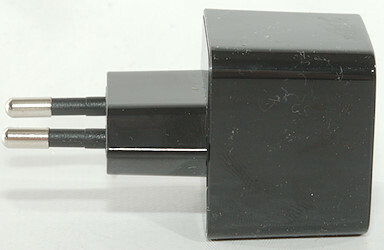 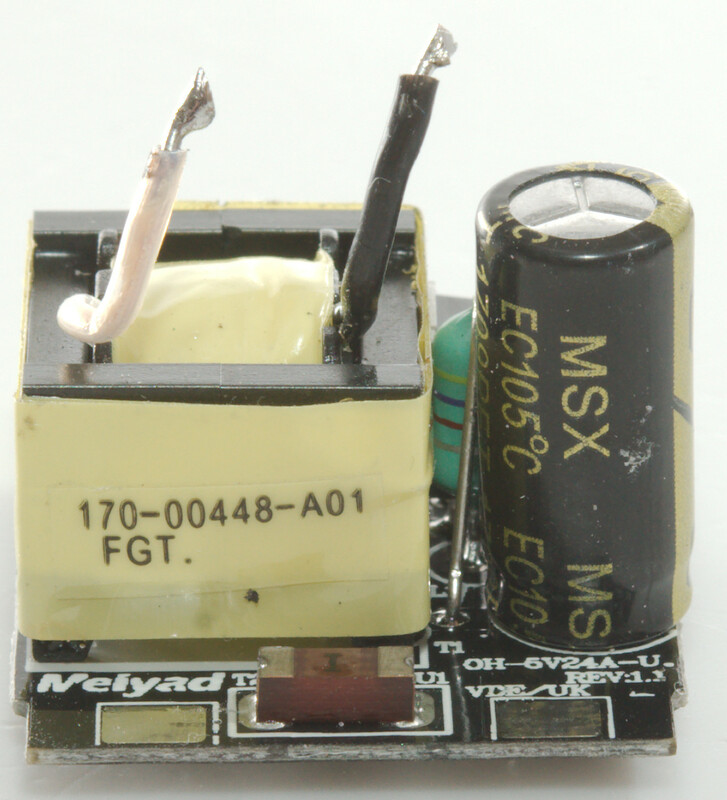 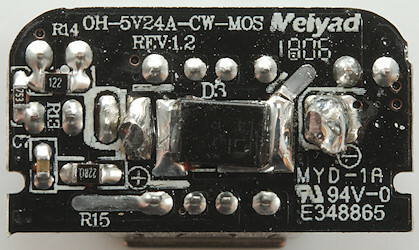 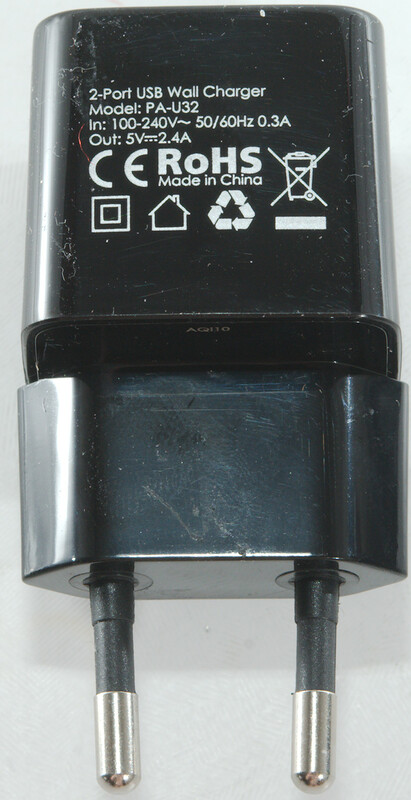 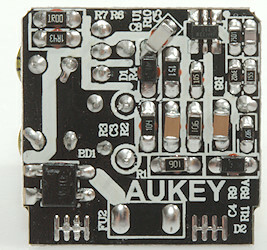 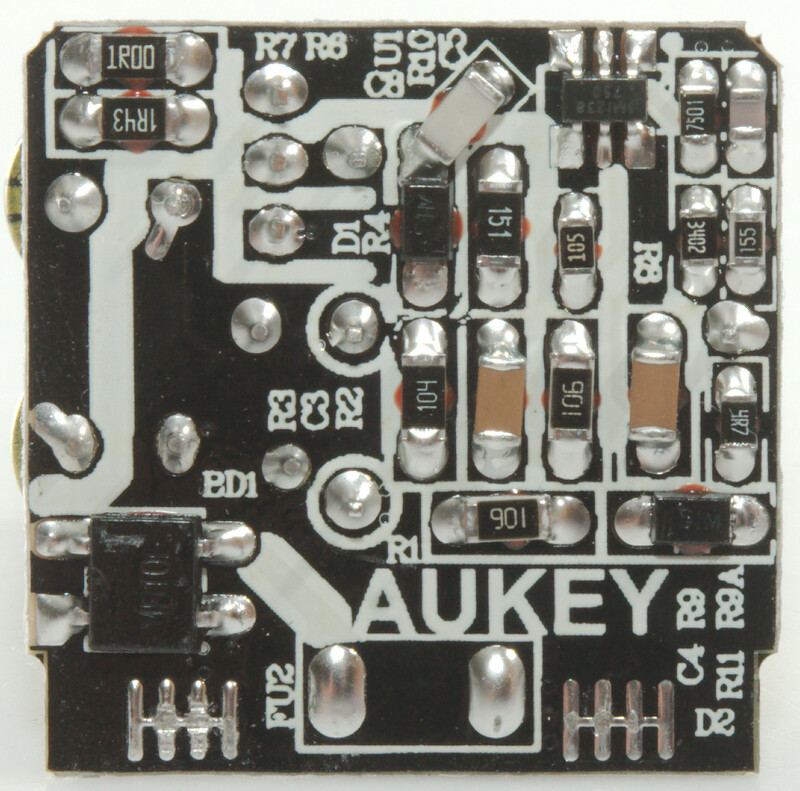 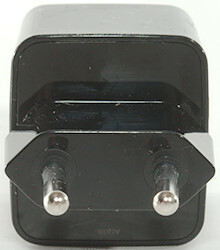 This small charger has very good safety distances due to the two circuit board with plastic between.